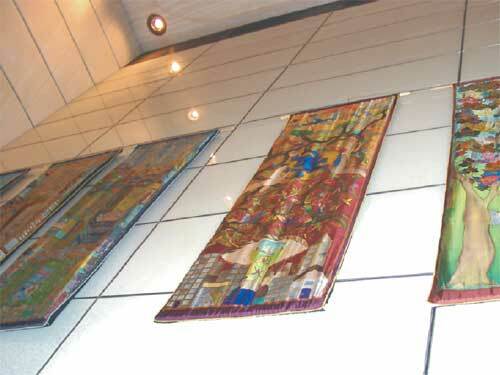 Silk banners made for the Landsbury Festival of 2000 exhibited here at the entrance of the Jubilee Line at Canary Wharf. Textile artist Sarbjit Natt worked with seven groups of local people of varying ages, from 8 to 80 years old, in the Lansbury and Blackwall nieghbourhoods in East London painting these exquisite pieces. They now hang in the Museum of Docklands, West India Quay.